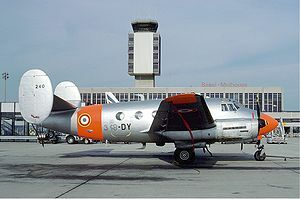 The Dassault MD 315 Flamant is a French light twin-engined transport airplane built shortly after World War II by Dassault Aviation for the French Air Force. 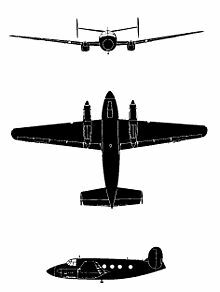 Design work on a twin-engined light transport started in 1946 with the MD 303, a development of an earlier project for an eight-seat communications aircraft the Marcel Bloch MB-30. 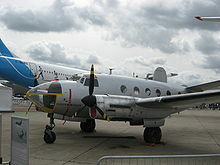 The prototype MD 303 first flew on 26 February 1947 powered by two B�arn 6D engines, designed to meet a French Air Force requirement for a colonial communications aircraft. A re-engined version was ordered into production at the new Dassault factory at Bordeaux-M�rignac. The production aircraft was a low-wing monoplane with twin tail surfaces and a tri-cycle undercarriage and powered by two Renault 12S piston engines. The aircraft was used for pilot training, navigation training, light transport, maritime surveillance and light ground attack. During the Algerian War of Independence the plane was used for light attack with the Nord SS.11 and AS.11 antitank missiles or with machine guns, bombs, and rockets. The Flamant MD 311 (which were based in Algeria to train pilots and navigators at first) was the first aircraft in history to fire one of the world's first wire guided antitank missile in anger, using French Army SS.11 antitank missiles, in a combat experiment to get at fortified caves located in deep mountain gorges, 1956 from an aircraft based with the special unit of the French Air Force in Algeria, GOM.86. The SS.11 attacks proved extremely successful and the French Army which had provided the missiles, began an experiment which resulted in the worlds first attack helicopters firing antitank missiles. The Flamant stayed in service until 1981. In addition to the French air force, the Flamant served in Cambodia, Madagascar, Tunisia, and Vietnam. Dassault MD 315 Flamant Pictures and Dassault MD 315 Flamant for Sale.